Edi Santosa Department of Agronomy and Horticulture, Bogor Agricultural University, Bogor, 16680, Indonesia. Weeds are one of the most limiting factors in rice cultivation. This study aims to evaluate the eff ects of rice planting patterns on the prevalence of several weed species, Cyperus iria, Echinochloa crusgalli, Fimbristylis miliacea, Leptochloa chinensis, Ludwigia octovalvis, and Spenoclea zeylanica, and to discuss the implications on rice production systems. The research was conducted in IPB Sawah Baru experimental farm in Bogor, West Java, Indonesia, from December 2017 to April 2018. The experiment was arranged in a randomized block design with two factors, rice varieties and rice planting methods. The rice varieties, “IPB 3S” and “Ciherang”, were assigned as the main plot, whereas planting methods, i.e. 25x25 tile, Legowo 2:1 (double rows), Legowo 4:1 (quadruple rows), as sub-plots. The results showed that in the “IPB 3S” plots L. octovalvis shoot dry weight decreased by 33.0%, the root dry weight of L. chinensis roots decreased by 22.6%, and the number of S. zeylanica weed leaves decreased by 28.4% compared to the plots planted with “Ciherang”. With legowo 2:1 planting method the dry weights of L. octovalvis decreased by 21.5%, L. octovalvis by 1.7%, and L. chinensis by 4.4%, and the number of weeds E. crus-galli by 7.0 % compared to Tegel 25x25 method. L. chinensis seemed to be a dominant weed at both vegetative and generative stage of rice development. Anggraini, F., Suryanto, A., and Aini, N. (2013). Sistem tanam dan umur bibit pada tanaman padi sawah (Oryza sativa L .) varietas Inpari 13. Jurnal Produksi Tanaman 1, 52–60. Awan, T.H., Chauhan, B.S., and Crus, P.C.S. (2014). Physiological and morphological responses of Ischaemum rugosum Salisb. (Wrinkled Grass) to different nitrogen rates and rice seeding rates. PLOS ONE 9, 98255. Badan Litbang Pertanian. (2013). “Sistem Tanam Legowo”. Badan Litbang Pertanian. Kementerian Pertanian. 32 pp. Indonesia. Bradley, K.W. (2006). A review of the effects of row spacing on weed management in corn and soybean. Crop Management doi: 10.1094/CM-2006-0227-02-RV. Chauhan, B.S., Pame, A.R.P., and Johnson, D.E. (2011). Compensatory growth of ludwigia (Ludwigia hyssopifolia) in response to interference of direct-seeded rice. Weed Science 59, 177–181. Dass, A., Shekhawat, K., Kumar, A., Sepat, S., Singh, S., Mahajan, G., and Singh, B. (2016). Weed management in rice using crop competition-a review. Crop Protection 30, 1–8. Galal, T.M. and Shehata, H.S. (2015). Impact of nutrients and heavy metals capture by weeds on the growth and production of rice (Oryza sativa L .) irrigated with different water sources. Ecological Indicators 54, 108–115. Guntoro, D., Chozin, M.A., Santosa, E., Tjitrosemito, S., and Burhan, H. (2009). Kompetisi antara ekotipe Echinochloa crus-galli pada beberapa tingkat populasi dengan padi sawah. Jurnal Agronomi Indonesia 37, 202–208. Heddy, S. (2012). “Metode Analisis Vegetasi dan Komunitas”. Rajawali Press. Indonesia. Ikhwani, Pratiwi, G.R., Paturrohman, E., and Makarim, A.K. (2013). Peningkatan produktivitas padi melalui penerapan jarak tanam jajar legowo. Iptek Tanam Pangan 8, 72–79. Jha, P. and Norsworthy, J.K. (2009). Soybean canopy and tillage effects on emergence of Palmer amaranth (Amaranthus palmeri) from a natural seed bank. Weed Science 57, 644-651. Kementan. (2016). “Statistik Pertanian 2016”. 400 pp. Indonesia. Khaliq, A., Hussain, S., Matloob, A., Tanveer, A., and Aslam, F. (2013). Swine cress (Cronopus didymus L . Sm .) residues inhibit rice emergence and early seedling growth. The Philippine Agricultural Scientist 96, 419–425. Mahajan, G., Gill, M.S., and Singh, K. (2010). Optimizing seed rate to suppress weeds and to increae yield in aerobic direct seeded rice in North Western Indo-Gangetic Plains. Journal of New Seeds 11, 225-238. Marin, C. and Weiner, J. (2014). Effect of density and sowing patern on weed suppression and grain yield in three varietas of maize under high weed preasure. Weed Research 54, 467-474. Olsen, J.M., Griepentrog, H.W., Nielsen, J., and Weiner, J. (2012). How important are crop spatial pattern and density for weed seppression by spring wheat. Weed Science 60, 501-509. Pratiwi, S.H. (2016). Pertumbuhan dan hasil padi (Oryza sativa L.) sawah pada berbagai metode tanam dengan pemberian pupuk organik. Gontor Agrotech Science Journal 2, 1–19. Primilestari, S. and Edi, S. (2015). Penerapan teknologi untuk meningkatkan produksi padi sawah pada lahan tadah hujan kota Jambi. Prosiding Seminar Nasional Lahan Suboptimal, 1–9. Saito, K., Azoma, K., and Rodenburg, J. (2010). 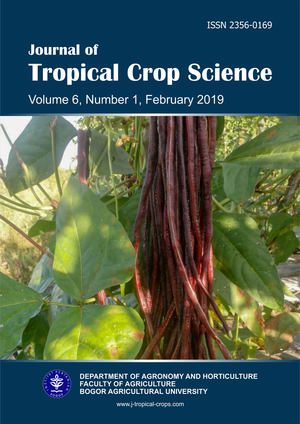 Plant characteristics associated with weed competitiveness of rice under upland and lowland conditions in West Africa. Field Crop Research 116, 308–317. Stewart, A.M., Edmisten, K.L., Wells, R., and Collins, G.D. (2007). Measuring canopy coverage with digital imaging. Communications in Soil Science and Plant Analysis 38, 895-902. Wahyuti, T.B., Purwoko, B.S., Junaedi, A., Sugiyanta., and Abdullah, B. (2013). Hubungan karakter daun dengan hasil padi varietas unggul. Jurnal Agronomi Indonesia 41, 181 – 187.